WUD: Four Walks in the Fictional Woods. by Contibutors: Alexander Binder, Ellie Davies, Grant Willing and Jonathan Illingworth. WUD: Four Walks in the Fictional Woods. 'Photobook of the Month' in Dazed & Confused magazine Photography. Inspired by Russell Hoban's classic novel Riddley Walker. Four photographers, four sections. Featuring new and original work by Alexander Binder, Ellie Davies, Grant Willing and Jonathan Illingworth. General information: 160 pages. 68 images (38 colour and 30 b&w), printed facing page only on 135gsm White Fedrigoni Symbol Tatami paper. Very large format, approx. 9"/225mm wide x 13"/325mm tall. Handbound at the Tangerine Press workshop, using acid-free papers and boards, conservation glue, hemp cord; distinctive Tangerine logo stamped onto the front cover; 3-colour title page. ISBN 978-0-9573385-0-0 All 100 copies signed by all four photographers. There are four different editions, totalling 100 copies: 'LEPISMA' edition: 30 numbered/signed copies. Fully bound in Colorado Rhine Blue cloth covered boards; Tangerine logo and WUD signature stamped in silver onto the front cover; 3-page 'stepped' 160gsm Canson Mi-Tientes front endpapers—the page colours being Sepia, Pale Clay and Ochre; 160gsm Canson Mi-Tientes Sepia back endpapers; letterpressed 90gsm Fabriano Ivory paper, denoting edition. 'THERMOBIA' edition: 30 numbered/signed copies. Fully bound in Colorado Amazon Green cloth covered boards; Tangerine logo and WUD signature stamped in gold onto the front cover; 3-page 'stepped' 160gsm Canson Mi-Tientes front endpapers—the page colours being Grey Slate, Light Brown and Lavender; 160gsm Canson Mi-Tientes Grey Slate back endpapers; letterpressed 90gsm Fabriano Ivory paper, denoting edition. 'BLATTELLA' edition: 30 numbered/signed copies. 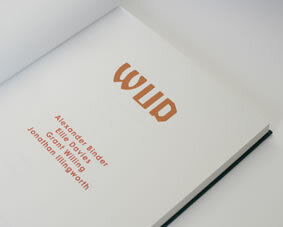 Fully bound in Colorado Tigris Gold Yellow cloth covered boards; Tangerine logo and WUD signature stamped in black onto the front cover; 3-page 'stepped' 160gsm Canson Mi-Tientes front endpapers—the page colours being Burst Orange, Apple Green and Light Blue; 160gsm Canson Mi-Tientes Burst Orange back endpapers; letterpressed 90gsm Fabriano Ivory paper, denoting edition. 'LYMANTRIA' edition: 10 lettered/slipcased/signed copies. Fully bound in Colorado Darling Deep Brown cloth covered boards; Tangerine logo and WUD signature stamped in orange onto the front cover; 3-page 'stepped' 160gsm Canson Mi-Tientes front endpapers—the page colours being Poppy Red, Royal Blue and Violet; 160gsm Canson Mi-Tientes Poppy Red back endpapers; letterpressed 90gsm Fabriano Ivory paper, denoting edition. Also, a tipped in, signed/dated/lettered colour print by Mr. Binder of an image not included in the book. Slipcase bound in 60gsm Japanese Awagami (Brown with Black streaks) paper, that has been printed and embossed to imitate a lacquered grain effect. SOLD OUT.